Rather than fight each other, Amir Khan and Kell Brook have been fighting over who can face the most outrageous opponents instead, but signs are that a meeting between the two is at least on the radar for 2017. Amir Khan is back in training following hand surgery and talking of a British ring return in April against an opponent yet to be determined, although Kell Brook won’t be his pugnacious homecoming first date. 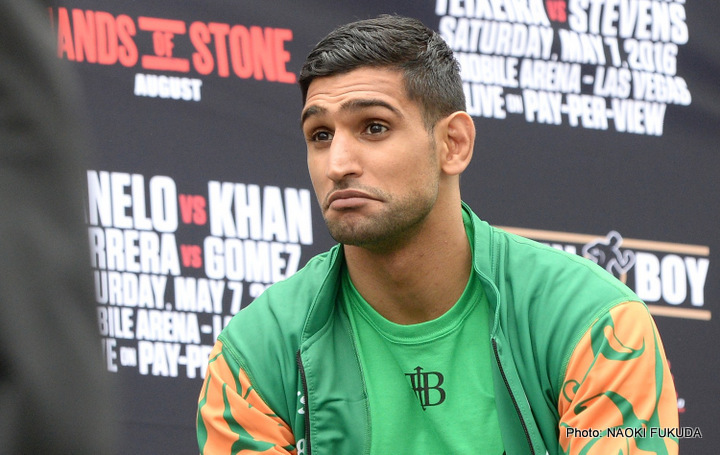 Back when it was announced that Khanwould be moving up two weight divisions from welterweight to face Saul ‘Canelo’ Alvarez at a catchweight of 155lbs, he was praised for his bravery but questioned for his matchmaking in equal measure. Khan is rarely in a dull fight and has numerous attributes but punch resistance is not amongst them. Similarly, Saul Alvarez is rarely in a dull fight and punching power is amongst them. So the action let alone the result, when the two met on 7thMay, 2016 in Las Vegas, and brave as Khan was to meet the challenge, would only end one way. Khan fought with his expected speed, elusiveness and point-scoring right up until 2 minutes 37 seconds of the 6th round, when the similarly expected and fight-ending Canelo bomb detonated on the point of Amir Khan’s chin. It was highlight reel stuff out on the periphery of the Mojave Desert. Kell Brook certainly does have aworld title, the IBF World welterweight title to be exact, which he took in a solid win over Shawn Porter in 2014. Khan is also correct in saying that Brook was “going down his route”, a route that had Gennady ‘GGG’Golovkin at London’s O2 Arena on 10th September, 2016 as the destination. Golovkin is the angelic looking demon and unified middleweight champion who going into the Brook fight, had won all 35 of his professional bouts, 32 by knockoutfollowing an outstanding amateur career posting 345 wins in 350 encounters. If Amir Khan challenging Canelo was risky, Brook’s date with GGG destiny was not only risky but dangerously risky. Fortunately, that risk of real danger only lasted 15 minutes with Brook’s corner wisely throwing in the towel at the end of the 5th round as their fighter blinked through a broken right eye socket. So with knockouts in Nevada and impaired vision in London behind them, Khan and Brook find themselves in familiarly adversarial territory again. “Glad you’ve woken up from your last KO, I believe our teams are talking I look forward to sending you back to sleep #QueenKardashion.” Replied Kell Brook.